In a large mixing bowl, pour in hot water. Add contents of Monterey Jack Cheese Sauce Mix bag (15.5 oz) into water while vigorously stirring with a wire whisk. Continue stirring until mix is completely dissolved and cheese sauce is smooth. Add beer to cheese sauce. Stir to combine. Add cheese to sauce. Stir to combine. 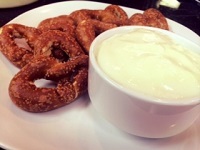 Serve warm as a dip with soft pretzel sticks.